I like 3D paper things, and multiples of things, and Valentine's Day. The other night I made these paper hearts while watching TV. You could stick them on a wall or door temporarily, or glue them to a board permanently to make a 3D wall poster. They'd be cool to attach to presents, too. Surprise somebody with an explosion of hearts! These are made from traditional heart shapes with a slit cut partway down the center. 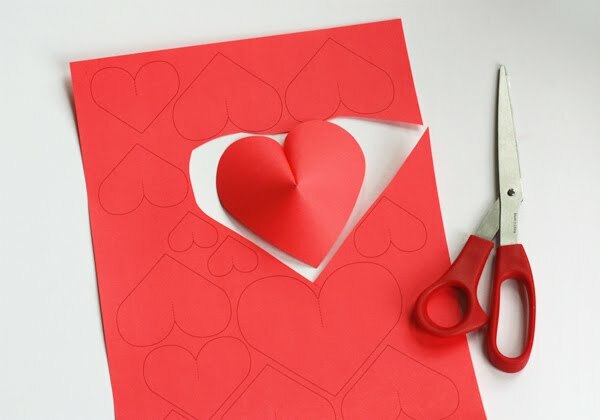 Cut your own hearts freehand, or print and cut out the shapes on the template I made, which might be faster and uses fewer brain cells. 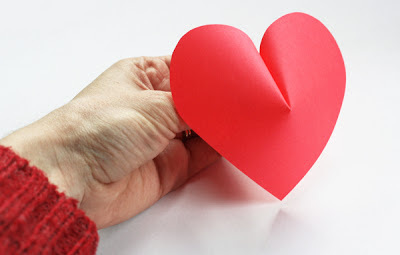 Download the page of hearts here. To make a flat heart into something three dimensional, roll the inner edges of the two arcs toward the back with your fingers to get the shape started. Then add a bit of glue or double-stick tape along one edge. 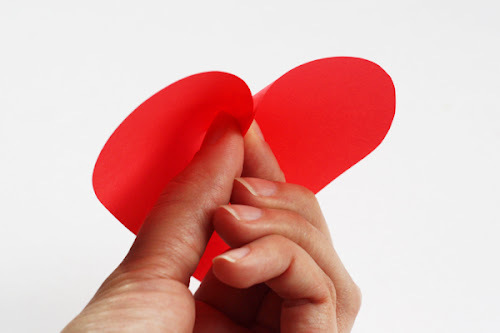 Pinch the two edges of the heart together from the back, forcing the center to naturally pop up. 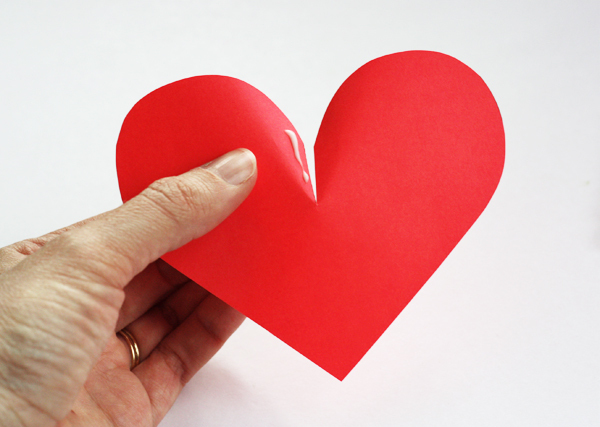 When the edges are glued together, the heart looks 3D. I used bits of double-stick tape to secure mine—a speedy method—but a few of the hearts popped apart within a couple days and had to be re-stuck. Glue holds better, I found. Once you get the hang of it, you can bend that paper to your will and make dozens. 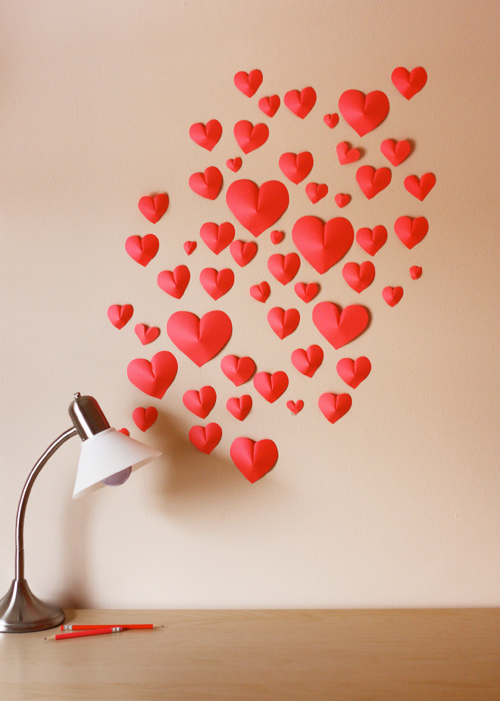 Then stick a flock of hearts to a wall with loops of tape or poster putty placed at the bottom point on the back side of each shape. Mum, in case you were going to comment on it, I'll beat you to the punch. I did NOT match my cardigan sweater to the paper on purpose. That was an accident. Now I forgot what I was really gonna say. Oh, yeah... that's pretty cute! Did Alex like it? Oh! I just grabbed a scissors and didn't even notice! I have 5 of those left over from one of the Craft Socials. Alex hasn't seen it yet. I just put them up and he's not home yet. I'm certain his first comment will be either, "Why are there hearts on our wall?" or else "There are hearts all over our wall." I say this from experience. He tends to state the obvious instead of exclaiming as rapturously as one might hope. But I love him to death. Yeah, he's pretty lovable. :) You must report back here with which one he said! I will. I think he's getting home late, so it might not be until tomorrow. I will be sure to note his comment. If we could put two together they would be like fortune cookie hearts. Wahou ! It's crazy all these little things you can do with a sheet of paper ! This is great! I'll be using it in my Sunday School class this weekend - perfect timing! Thanks! I came across your on pinterest via this pin and as a fellow paper craft lover I am floored I haven't found your blog before. I absolutely LOVE how this looks, even to be used in my daughter's room when it's not Valentine's Day. Great idea! Report: Alex just saw the wall. His first and only words: "Hey, you changed the wall in here. [Long pause.] Huh. Interesting." I work with adults with developmental disabilities and am always looking for simple and fun crafts to decorate their homes for the different holidays. This one is great! thanks! I just might try three 3D hearts together for Shamrocks next month! I love the effect of hearts of different sizes on the wall. They look like little joyful bubbles. so cute, Thanks for the kid craft to entertain kiddos during super bowl. LOVE THESE! So simple but so effective! Pop-Art Hearts! I love the way this looks. I am totally going to surprise my kids with this. You can also maybe put a little message on a few of them! Lovely and much more impressive than the ones I've been doing since second grade! ooohh, so cute and lovely! Jillian, your hearts look terrific! Thanks for the great idea! I just did some in my store window display, but found that card stock was a bit too thick to achieve that little dimple without wrinkling the rest of the heart. Since I had already cut out 30+ hearts and didn't want to chuck them, I folded one curve over the other slightly, which still gave a 3D effect, though not as cute as yours, but effective for using what I had. Simply lovely! I really like how it complements the wall! Thanks for sharing this wonderful project! I can't download pdf file... Can you help me? If you are still having trouble, email me and I'll reply and send you the file. Ah, a little internet theft going on, eh? Thanks, I've left them a comment. Great idea, thanks a lot. I just share it on my blog. Thank you.I used your design with different papers and hung the hearts over the headboard of bed. My husband really liked them so we still have them on the wall. Great idea..Looks super easy too..Linked on my blog .. These are gorgeous! What kind of paper did you use? Can you please go into more detail about how to attach them to the wall? I'm a clueless non-crafter but I'd like to try these. I used the red from a pack of Astrobrite copy paper (by Wausau Paper), available at probably any Office Max, Office Depot, Staples, etc. I rolled a piece of scotch tape into a tube shape and placed it on the back of the heart near the bottom point, or sometimes along the side. This made the tape sort of 3D, and then I pressed the heart to the wall right there. what kind of paper was used for this? I tried it with regular construction paper but it was too thin and bent too easily. Wow! looks easy but amazing! I actually did this and while I had some trouble getting them to stick to my wall, they were adorable. I also blogged my little craftiness and shared it on Keeping Up with the Johnson's. Mindy, looks great! Thanks for sharing. And good to know 3M command adhesive worked for you! The "hearts" template and ideas are incredible. I teach 6th grade religious education and this year we are in the Year of the Faith...which the bottom line is love. These hearts will be in multiples by my class to share with our community and their families. I am thinking of using them as the St Patrick hearts too that I noted. Hey, purple hearts sound great too. Susan loved your idea of putting two together for fortune cookies. Can you imagine using the template hearts over magazine pages and cutting them out. Talk about recycling. 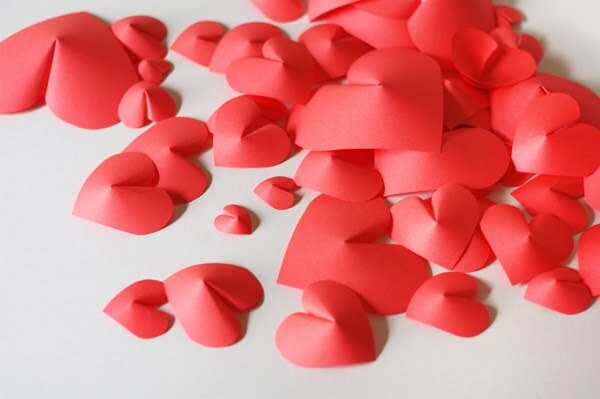 I love this post and I want to make this wall paper hearts as soon as possible. I also search this at PIJ and I hope I will get this there. Yeah, I see a bunch of them there. Thanks. I have to tell you I enjoyed the bit about your hubby as much as I enjoyed the hearts.. I will be making these one nigh while brain numbingly watch tv. thanks love your idea. I thought the same thing but didn't think of the fortune cookie part. I was thinking get of putting tack line in between the chains and hanging in my classroom from the ceiling! I just found your blog and I'm in heaven! I love the wall of hearts! I cant wait to make them. Hey Jessica! I am working on a blog post for a nonprofit - http://gopaintlove.com/ on valentine's day crafts. Would you mind if I featured this project? So cute! Hi Madison, You're welcome to use a single image with a brief description and link back to any post. Republishing posts in their entirety is not allowed. Thanks for asking! Hi! Your 3D hearts design is wonderful! I'm a longtime fat rights activist. I saw a way to repurpose them a bit for people in my community, in time for Valentine's Day this year. I posted about it here, with credit and link to you. Nice & easy ! Thanks! It's easier to just use a staple instead of glue.